I received a phone call from a lady who had found this Mallard duck which was unable to walk. Something was wrong with its neck as it wasn’t able to put its head down within 2 inches of the ground. I told her that I needed to look at it and check it out. Sure enough, the duck’s neck was all out of alignment. It was obvious the duck was in pain and super thin from not being able to get its head down to the ground to eat. Apparently something had caught it and it fought and got away, or it might have gotten caught in something and pulled itself free resulting in the neck injury. I remember that sometime ago Susan Manning mentioned that Jan Harper was a therapist and worked with animals. I figured if she could help dogs, cats, horses, then why couldn’t she help a duck? I called her and this was her first duck therapy, but she was willing to give it a try. She came over the next morning and she worked on the duck about 20 minutes with neurological stimulation. After she finished the therapy, I let the duck go to see if it could walk and sure enough it could!!!! In no time at all it was going around picking food up off the ground and walking all over the place. I stood there in amazement. I called the lady that had rescued the duck and she confirmed the duck wasn’t walking when she found it. I watched the duck closely for the next week and noticed she was swimming well and acting like a normal duck. She was doing so well that I figured one more therapy would help, so a week later Jan performed her magic again. 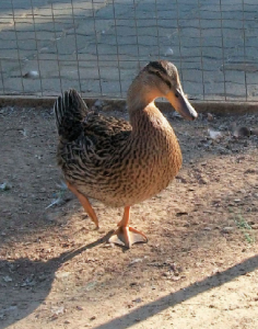 The duck kept getting better, eating well and gaining weight. This duck will have a permanent kink in its neck, but otherwise nothing to keep it from being returned to the wild. This duck was released thanks to Jan Harper.